Two more Iranians were executed, yesterday, by the Islamic republic regime accused of "Murder", "Kidnapping" and "Drug Trafficking". One of these new victims of the barbarian mullahs' regime, who was not identified, was hanged in public in the southern city of Kerman. The second , named as Reza, was hanged in the central prison in the northeastern city of Mashhad. Three more Iranians were executed, yesterday, after having been accused of being "thugs" and for having "disrupted public security". These public executions took place in the northeastern City of Sabzevar. The news of the executions was reported by the official "Khorassan Daily" but the names of these victims were not reveled. Sabzevar was the scene of several riots, which took place two years ago, and it's believed that the three victims were in reality exasperated Iranians who had stood up against the Islamic regime's forces' use of brutality. Tens were injured or killed during the clashes which sparkled under the motif of the Khorassan province's spilt between four new administrative entities. Several public buildings were damaged by protesters who retaliated to the brutal attacks made by militiamen. 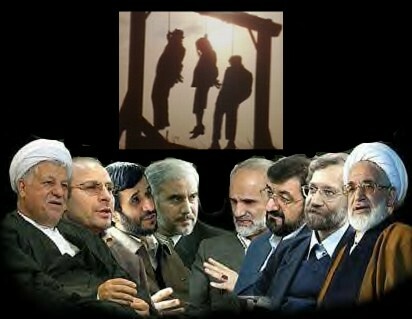 Public executions, in Iran, are common as the theocratic regime uses them in order to show to the population the consequences of what can happen due to the expression of their aspiration for a total change.